do we go about gaining that inner state? As someone who struggled for much of my life for every ounce of confidence I ever felt, I can tell you that confidence is worth finding, both personally and in the context of home educating your children. I just wish it was something tangible, that once you had it you could keep it in your pocket! Confidence is a lot more ethereal and intangible than that, sadly, but once you get familiar with it, it becomes easier to find your way back to it. It isn’t supposed to be an elusive feeling – it’s supposed to be a resident state of being, that if disturbed, leads you to find the cause, address it, and resume your usual state. In the home education environment, I believe that confidence is helped tremendously by doing some of the hard yards described elsewhere on Hedjumacation: things like figuring out what your philosophy of home education is, what your approach to it will be and knowing why you’ve chosen to do things the way you have. Knowing those things helps you answer with ease a great number of the challenges that you’ll face along the way. The following components of Confidence are taken from O’Reilly’s article as referenced below, but I’ll endeavour to explain the individual components in the context of home education. You can read the original article  to see the concepts explained in more general terms. Self Acceptance means understanding who you are and accepting your faults. Perhaps your creativity lies in areas of organisation rather than innovation – by accepting that in relation to your home education experience, you can exploit your innate creativity and either develop other aspects in yourself or benefit from the different creative expressions of others. Accepting yourself as you are helps you to find joy in what’s real about yourself and voids the notion that you’d be better if you were more like someone else. It also releases you to find other ways to meet the needs of your child’s education externally, quite free from any shame that you should be able to do it all yourself. Self acceptance can also enhance your ability to appreciate others, free of jealousy or feelings of personal deficit. Self Respect is taking care of yourself and treating yourself right. 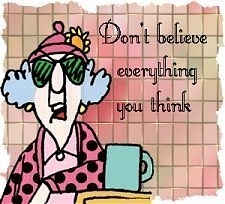 Someone sent me a Maxine cartoon which proclaims, “Don’t believe everything you think.” Oh how true! Our minds, our self-talk as we’re home educating our children, can undermine us so completely, yet our thoughts can run along so subliminally that we don’t even recognise what’s happening. It is completely worth the effort of training yourself to catch yourself out with what you’re thinking. When I catch myself out thinking that I’m hopeless and if only I was more creative or had a better sense of humour, these days I know that I need to stop that. A little technique I picked up somewhere was to think of another home educator who I currently have tremendous respect for (that can be a different person every time I do the exercise), and I think about how I would show them respect if they were in my situation. I would speak kindly and encouragingly; I would make sure they were fed, hydrated and rested, etc. It’s quite bizarre, turning those behaviours towards yourself: to arrange to have a half-hour nap, or an hour’s reading time, or to go and look at yourself in the mirror and speak kindly to yourself. In this sense, those cosmetics commercials speak the absolute truth: you’re worth it! Self Esteem is the value you place on yourself. Self Belief is trusting yourself and having faith in your judgement, skills and yourself as a person. Home educators can easily consider that “everyone else is doing it better than me” or that “teachers are trained for this, so they know better”. Both considerations betray lack of self belief. In fact, neither statement is actually true. Of course teachers are trained to teach groups of children within the school system, but they are not trained to teach your individual child in the home education environment. In terms of ‘everyone else’, well they’re just doing a different job, and it might not work for your children, or even be working for their children as well as you (as an external observer) perceive. When you believe in yourself, you believe in your ability to make good decisions for and with your child, and that whatever the next step is, you’ll be able to figure it out together. Such a definition can easily lead us to object that self love is synonymous with selfishness, which itself is completely contrary to the nature of home education, which takes a lot of sacrifice from a parent. In truth, however, if we are unable to love ourselves, we are not able to effectively love others. Allowing someone to treat you like a doormat is not love, in any context. When children grow, knowing that all family members have equal value, though different functions within the family unit, their own self love develops in a healthy fashion. We help to equip them for healthy adult relationships in their future, as well as assuring our own well being in the midst of current and future circumstances. Self Assurance is personal certainty regarding your own character and inner values. The self assured home educator is aware of their purpose, and is able to validate that for themselves, rather than looking to others for such validation. O’Reilly says , “self assurance is knowing that you’ll succeed at what you do, while self belief is knowing that regardless of the outcome you’ll be okay. Both are necessary and complimentary. Self belief is what keeps you going, self assurance is what gets you there.” For us, the self assurance in our home education lies in what we believe is right for our child, and our belief that as her parents, we are best equipped to provide that for her – those beliefs have their roots in our character and values. Self Determination is the freedom to be in charge of your own life. Self Admiration is the ability to acknowledge and celebrate your achievements and good character. Out of proportion, of course this trait of Confidence can easily become arrogant and inflated pride. In proportion, however, the ability to recognise when you’ve done a good job, or rightly held your ground over a principle, etc., is a tremendous aid to our confidence in home education. When you’ve patiently explained the principles of dividing fractions for the forty-seven-millionth time and your child later wanders in from playing and casually comments, “Oh, I get it!”, not only is that cause for congratulations for the child, it is also quite appropriate for you to be personally relieved, joyful, and proud of your own patient persistence. Your personal celebration might only be a private ‘woo hoo!‘ while your congratulations of your child is far more effusive, but it is every bit as valid. Together you reached the goal. It is okay to acknowledge and celebrate the great things you’ve done and the fantastic person you are. Interestingly, in his conclusion to this article, O’Rielly  encourages the use of this model of confidence as a diagnostic tool to gauge your own confidence. You might be discussing home education with someone you don’t know very well, and suddenly feel very nervous in their presence. You might ask yourself what specific area of confidence do you need in this situation. Do you think you’re not valuable or worthy enough to talk with the other person (self esteem)? Are you nervous in case the other person doesn’t like you (self acceptance)? Are you unable to see yourself being happy after the conversation (self assurance)? Of course there can be myriad other factors too, but these give you an idea of how the different components of confidence can be addressed. If your self esteem is at stake, you can train yourself to recognise and accept that human beings are all of equal value, regardless of financial or social standing, and quite apart from experience or eloquence on the subject of home education. If self acceptance is the issue, so what if the other person doesn’t like you? For someone to make such a decision, it usually has more to do with them than it does with you. Many years ago, I was in a situation where a woman I hardly knew decided that I was an awful, evil person, even though we had hardly spoken. Devastated, I spoke to my boss and his wife and begged to know what to do about the situation. Their words have often helped me in the intervening years – they told me, “Just keep on being yourself. You know that what she believes about you is untrue, so you have no reason to react.” Young and fearful as I was, that was hard to do, but I learned a lot, and before the paths of that woman and I diverged, she had apologised completely for her antagonism. If self assurance is the reason for your disquiet, it can be worth asking yourself why someone else’s opinion matters so much to you. There can be valid reasons, but often it’s more a case of being sure of your own path and being able to allow another’s path to be different. In situations where your confidence is rattled, whatever the reason for your unsettled state, it’s overcomeable. Gaining real confidence in your home education is genuinely attainable. Believe me, if I can do it, anybody can. Express Yourself – Assessing Self Determination in Your Life, What is Self Determination, page 3.